There are times in life when you simply must close your eyes and think of your happy place. Does yours involve warm sand, lapping waves and exotic fruit cocktails? Perhaps tanned people wearing few clothes walk by under swaying palm trees as somewhere, far off, the sound of sea birds and the faint strumming of a ukelele? A real beach vacation may not be in your stars this month, but a vivid imagination and a few stems of tropical flowers will certainly help take the chill out of winter and make a “happy place” out of where ever you are. If you or someone you love is in desperate need for a little R & R to somewhere sunny and warm, consider bringing the beach to them with these exotic flowers found only in lush lands where the palm trees sway. Sometimes called lobster’s claw or wild plantains, heliconia are native to the lush rainforests of the Americas and parts of the South Pacific. Cultivated as ornamental plants, these tall stems are topped with bright red, yellow, orange or pink waxy bracts that are held upright or sometimes droop downward in an alternating pattern. Reaching lengths of 2 to 3 feet, these unique blooms will last for several weeks as a cut flower and look amazing on their own in a tall glass vase. While they are a bit pricier than your average roses, you only need a couple of stems to turn a dirty kitchen into a tropical paradise. 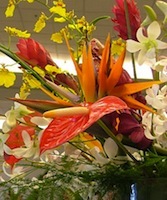 In the language of flowers, the heliconia symbolizes great returns, and you’ll get just that with with a few of these stems. One of the oldest flowering plants, protea (sometimes called sugarbushes) can grow in non-tropical climates, but their bright, showy flowers are so large and exotic looking they should come with a pina colada. 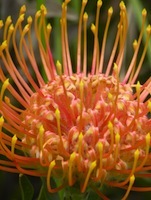 Tall and long-lasting, protea are available from most florist in a variety of colors and sizes. 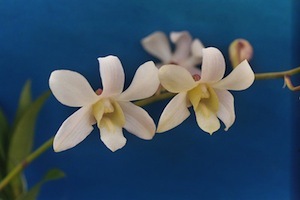 They look great on their own or mixed with less expensive orchids such as dendrobiums or mokaras. While the stems can come quite long, try trimming the protea down and arranging them in a small, round vase. Sometimes called flamingo lily, this tropical stem has a unique spade shade and comes in all the colors of a Tahitian sunset. Tall and graceful, the slender stems arch and end with a sinuous spadix in yellow or white. These blooms can’t stand the cold, so you won’t find them in the florist’s cooler but in a pot set in a sunny spot. Consider mixing them with the protea or a few stalks of gladiolas for a beach vacation without every leaving your home.